Backup your Divi site now! If you lost your website tomorrow, would it be a big deal? yes?…You need to backup your site today. I am 100% sure you will have heard this before, but you should always be backing up your websites (and have backups of all your other important documents, photos, etc for that matter). Many things can, and do, go wrong with website technology and you need to have a solid back-up implemented for when they do. Your site could get hacked or infected with malware, WordPress / Divi / plugin updates could break your site, you could break your site with a bad line of code, your disgruntled ex-employee could delete your site or any number of things could mean that your site goes offline or no longer works as it should. Some of these have happened to me in the past, and before I had my backups in order. these site emergencies were always a very stressful time. Now, I am confident that whatever happens, I have backups at hand, that I can restore in a matter of minutes. A backup is simply a copy of your website files and your database that is stored separately from your actual website that can be restored to replace your broken site when needed. How often should i be backing up my Divi website? Backup your site before updating WP, theme or plugin files as these updates can cause conflicts and break things. Schedule backups in respect of your content. If you are only blogging once a month, then you don’t need to back-up daily. Make a manual backup every month or 2 as a secondary backup to the more regular automated backup solutions you may have. What do I use to backup my Divi website? There are many ways to backup a Divi website and there really is no best option. 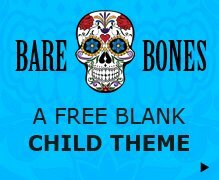 But, for Divi Theme Examples and all my my other sites I use the Updraft Plus free plugin that saves backups every day to a premium (1GB) Dropbox account. On top of this, I take manual backups that live on external hard-drives and have 7 days of hosting backups with my cloud hosting plan at Siteground. There are of course many ways to take backups of your site so I have listed a few of the most popular below. Take a look at (and actually implement at least 1 today) the following options and sleep soundly at night knowing that you have your back (website) covered. The options listed below are ones i use and/or ones that get consistent positive reviews and recommendations from members of the Divi and WP community. 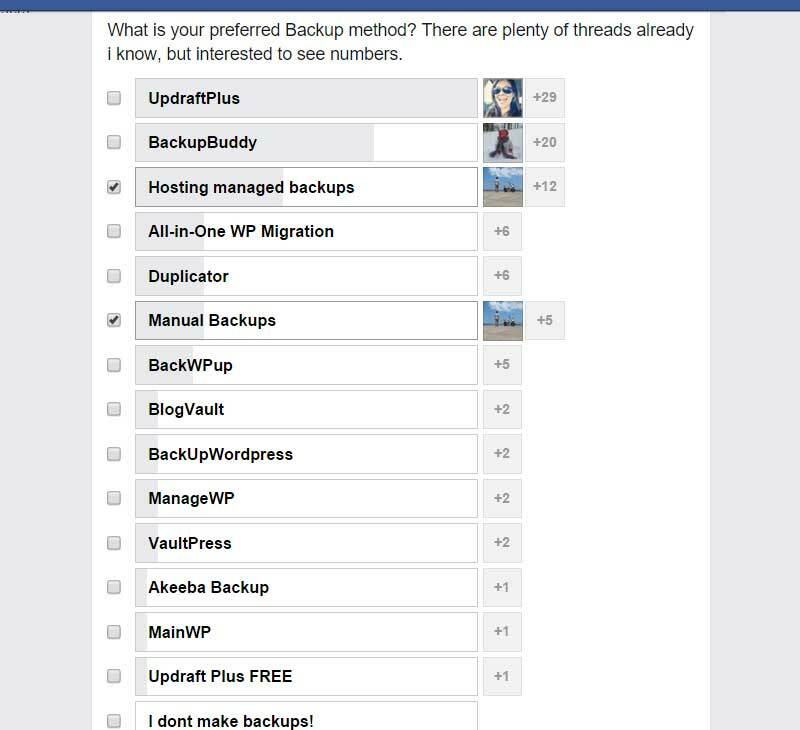 If you ask (or search as it’s been asked many times) in any of the Divi Facebook groups what people were using for backups, UpdraftPlus comes out on top every time as you can see below in one of the polls below. 5 backup options for your Divi website? Updraft Plus is a really popular option for a lot of Divi users and was given a big thumbs up from Elegant Themes by appearing in their Cream of the Crop: The 14 Best WordPress Plugins of 2015. I use Updraft personally and I know that it is always highly recommended by others in the Divi community. UpdraftPlus use Divi for their own website! You can check out the comparison between the free and premium Updraft Plus to see which suits your needs. As Dropbox is included in the free version That’s what I use. Backup Buddy from iThemes is another established backup provider that is regularly in the top 3 backup solutions recommended. Backup Buddy is a premium plugin with annual prices ranging from $80 for use on 1 site to $197 for unlimited sites. 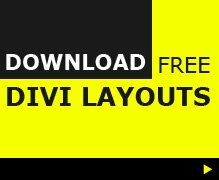 Most WordPress hosting plans for Divi will come with some sort of backup solution but it is essential to check exactly what is on offer. How many and how often are backups made? Is there a charge to restore the backups and how easy is the process? Are the backups stored on your servers or remotely? I would never reply on my hosting backups alone as problems with your host could be one of the reasons you need your website to be restored in the first place, but it can be a handy extra layer. Most hosts have a few ways to backup your Divi website so take a look at your hosting features or F.A.Q. and see what options they have on offer. Two popular solutions within cPanel come in the form of Click Restore and Installatron Backups. Click restore – Creates a 30 day rolling backup that can be accessed and restored via cPanel in a few clicks. Very easy to do, but the backups are stored on Panthurs servers, so if something catastrophic happens you may loose them, which is why i also use the 2nd option to backup to Dropbox. Installatron backups – The wordpress application you set up can be backed up via installatron, and the good thing about this is that they can be schedules (see image above) and can also be backed up to offsite locations, such as a Dropbox account. One of the big draw-cards for Vaultpress (now rolled into Jetpack) is that is was created by Matt Mullenweg (the WordPress co-founder) and his developers at Automattic. This gives you a lot of confidence to know that the developers can be know WordPress inside out and know how to ensure your backups go smoothly! Jetpack offers a free version but for backups you will need to get the premium membership. Automatic daily or real-time (professional plan) backups of your entire site, with unlimited storage space. A 30-day or unlimited archive of your entire backup history. A backup service provided by the people who run WordPress.com backups. Secure, off-site storage locations for your data, completely separate from your hosting provider. Manual backups requires a little more technical know-how (or ability to follow instructions) but it is a good way to know exactly what you are backing up and will help you understand the actual workings of your website. Backup plugins available today mean that not many people are manually backing up their WP sites, but the option is there if you want to get your hands dirty. Have a quick think how much your website is worth to you and how you would feel if you lost it all tomorrow. Your site itself may have cost you $1000+ or hours of your own time to build and hopefully it is now generating you income directly or via paying clients. Yes, it’s just 1 part of your business but until it’s suddenly taken away from you you may not really appreciate what it does for you every single day. If you don’t have a backup in place already, do it now! And, once you have set up your chosen backup method, test it to make sure it works and you know how to restore your site to a previously working version. Testing your backup is a lot less stressful to do before that dreded day comes when you may actually need it.